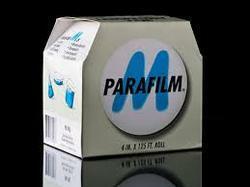 PARAFILM stretches up to 200% and clings even around irregular shapes and surfaces. The sealing film is free of plasticizers and consists primarily of polyolefins and paraffin waxes. PARAFILM M is resistant up to 48 hours against many polar substances, eg saline solutions, inorganic acids and alkaline solutions. Laboratory Systems, was established in the year 1999 and since then we are successfully exceeding the expectations of clients through the consistent manufacturing and exporting quality Disposable Laboratory Requisites. The huge variety of products offered by us includes Laboratory Plastic ware, Laboratory Glassware and Laboratory Consumables. Our instruments are well appreciated by clients for their user-friendliness, accurate results, longer life, compact designs and excellent performance. With an aim to meet the overwhelming demand of the scientific community, we provide an entire range of instruments right from basic lab equipment to most sophisticated instruments for research labs, Hospitals & Clinical Diagnostic Labs, Pharmaceutical & Biotech companies, Schools & Colleges. For meeting specific and individual requirements of our wide base of customers, we have adequate and sophisticated infrastructure, innovative quality control house a big team of domain professional and personnel who are specialized in managing and executing the production processes with the help of our advanced manufacturing arrangement. We are soundly geared up to undertake the project for custom-made configurations and ensure the delivery on promised time span. We have also taken up different strategic plans to figure out the prevailing trend and demands of the markets. Thanks to sincere dedication and onerous effort of our workforce, we are successful in developing the equipment that caters to crucial requirement in line with clients' specifications.